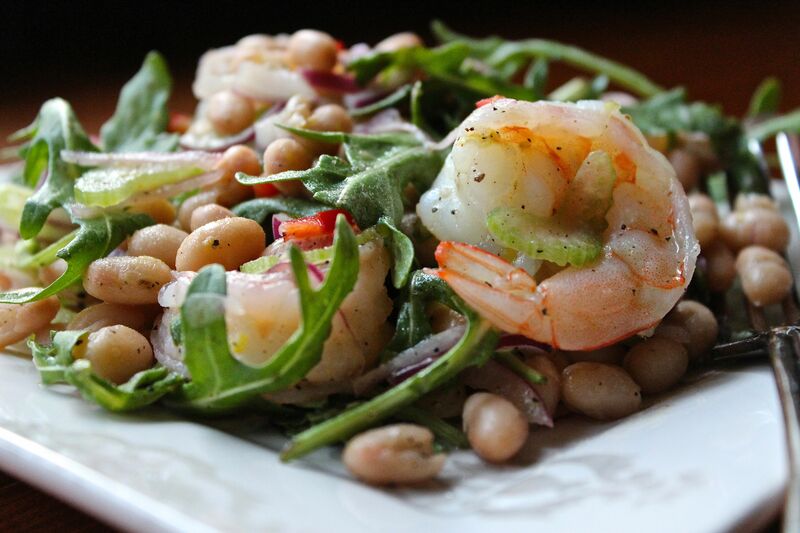 White Bean, Shrimp, and Arugula Salad | What about this? In my best “Fretalian,” my own blend of French and Italian, I asked my waiter “Scuzi, qu’est-ce que c’est?” as I pointed to the menu. He obviously did not understand “Fretalian,” because he looked at me questioningly. While traveling through Italy, I noticed an oft-appearing item on menus and I wanted to find out what it was. I tried again, this time in English. “What is rocket?” The young Italian waiter continued to give me a puzzling look, so I tried gesturing. I pointed to the menu and then shrugged my shoulders with my palms facing up to the ceiling. “Ah,” he said and motioned for me to wait and then ran off to the kitchen. A minute later he came out with a green leaf in his hand. I looked at the leaf and smiled as I nodded my head in recognition. “Rocket,” the mysterious menu item, was none other than arugula. “Grazie,” I said to him as I placed my dinner order. This little story came to my mind, while I was preparing this low fat and impressively nutritious salad. The arugula or “rocket” adds a nice peppery punch to the salad and it texturally balances the other ingredients. 1. Heat beans with a little salted water for 3 minutes. Drain and then tip into a bowl. 2. While they are still warm, combine beans with olive oil, lemon juice and zest, honey, pepper, and chili. 3. Allow to cool and then combine with remaining ingredients. 1. Instead of using a mild long red chili, I chopped up half a red jalapeno to give the recipe a little kick. 2. Not being a big fan of raw onions, I used less than half of a red onion and found this amount to be perfect for my taste. 3. I used large shrimp that came de-veined. I cooked them in water and Old Bay seasoning, drained them, and then peeled off their shells. Do not overcook the shrimp or else they will be dry and tough. 4. You might have noticed in the photograph, that there are no mushrooms. I had a mental “blip” and totally forgot to add them. It’s too bad because the mushrooms would have been delicious in this salad, not to mention the added nutrients they would have supplied!